Hey. I am Stacy, and I really like drawing. Right now I have a day job and just work a lot of conventions, but I want drawing to be my life one day. In 2015, I started drawing coloring book pages, because I thought the ones that had become so popular were lackluster and unexciting. Now, in 2018, I have over 60 different coloring pages (some sampled in this gallery) and am working on publishing a collection of books. Still looking for that special someone...a publisher, I mean. Favorite visual artist Glen Keane, for his expressive use of line. Ralph Bakshi and Brian Froud, for their stunning character designs and art styles. Kirby Rosanes, for their incredible eye for detail. Favorite movies Pom Poko, Kiki's Delivery Service, The Labyrinth, The Yellow Submarine, Disney on VHS Favorite TV shows Real Shows: The X-Files. Cartoons: Steven Universe, Gravity Falls, Over the Garden Wall. Anime: Jojo's Bizarre Adventure. Also, the whole of the Magical Girl Genre of Animation, it is for sure the spontaneous outfit change and glitter that has me. Favorite bands / musical artists David Bowie (I am pretty sure my muse is Bowie in disguise.) Favorite books Concept art books, Drawn to Life: The Walt Stanchfield lectures, White Stains Favorite writers Neil Gaiman, Stephen King, Lewis Carrol Favorite games The Legend of Zelda: Majora's Mask, Earthbound/Mother 2, The Persona and Shin Megami Tensei games Favorite gaming platform It is still the Playstation 2. The 3DS XL is pretty cool too. Tools of the Trade Steadtler Mars Lumograph drafting pencils. Other Interests The Last Podcast on the Left is my jam. 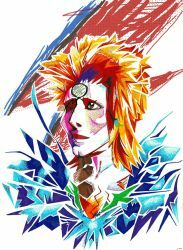 Listening to: David Bowie- "Wild is the Wind"
I was filling out an Application for Tora Con 2019, when I saw that a DeviantArt gallery counted as an acceptable portfolio for their selection process. So I thought 'why not?' and began loading some artwork in here. The reactions to my work were pretty instant, a lot of faves and collection grabs. THANKS GUYS! Now I think I'll stick around. Also, Wish me Luck! I really would love to get into Tora Con, since it was the venue of my first ever convention experience (Tora Con 2011, A good year). While I begin planning the 2019 convention line up, I am also working on a Zine! One of the local artist gatherings in the Western NY area is called Sugar City, and they are famous for having artist events and Zine Fairs every year. I started this Zine the night that I finished my last Sugar City Zine Fair, so my plan is to have it finished by next year's date. This zine will be a visual, and chronological, exploration of David Bowie's carrier and various personas. It will include coloring pages (that's my specialty), sketches, portrait drawings, paper dolls that showcase stage, photoshoot, and movie outfits, and (hopefully) articles and facts to go along with the art. As I said, my muse is Bowie in disguise. Anybody who is interested in me posting WIP submissions, let me know! I hope to gather a bunch of DeviantArt friends to poll on what coloring pages to do next, what to draw, and so on, YADDA YADDA...SO WELCOME NEW FRIENDS! Also, I LOVE taking commissions, BUT I have two large scale commissions that I am working on now, so not taking new commissions until one or both are finished. I will try to keep journaling into the void, but message me for details as well if you get curious. Welcome to ! Hope you enjoy it in here!